The Schiff Ultra Melatonin Tablets is a great dietary supplement to help you fall asleep faster and rest better. Schiff Ultra Melatonin Tablets contains a unique blend of vitamins, minerals, and herbs. 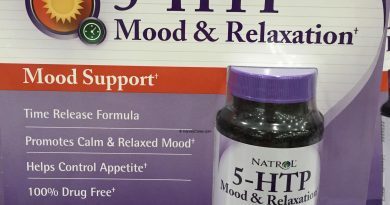 These include Melatonin, GABA, Vitamin B6, and a unique herbal blend. This Melatonin supplement is not a drug. Melatonin is naturally produced in the brain. Melatonin is a chemical that signals the body to prepare to and fall asleep. As you age, your natural Melatonin production may decline. Melatonin production and levels can also be impacted by a variety of other reasons. This includes your mood, stress, diet, and environment. 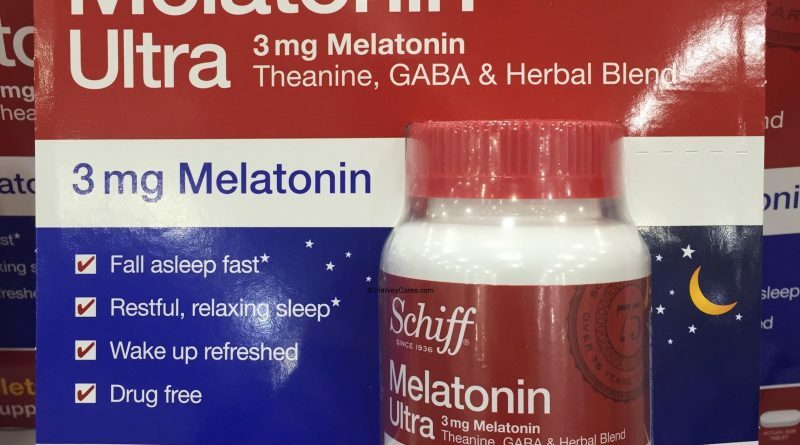 When you take the Melatonin tablet by Schiff, it can help you fall asleep faster. Take Schiff Ultra Melatonin Tablets before you sleep. The Melatonin pills can help support your natural sleep process. This Melatonin supplement can help you fall asleep. And it can help you sleep well. You will also wake up more recharged. 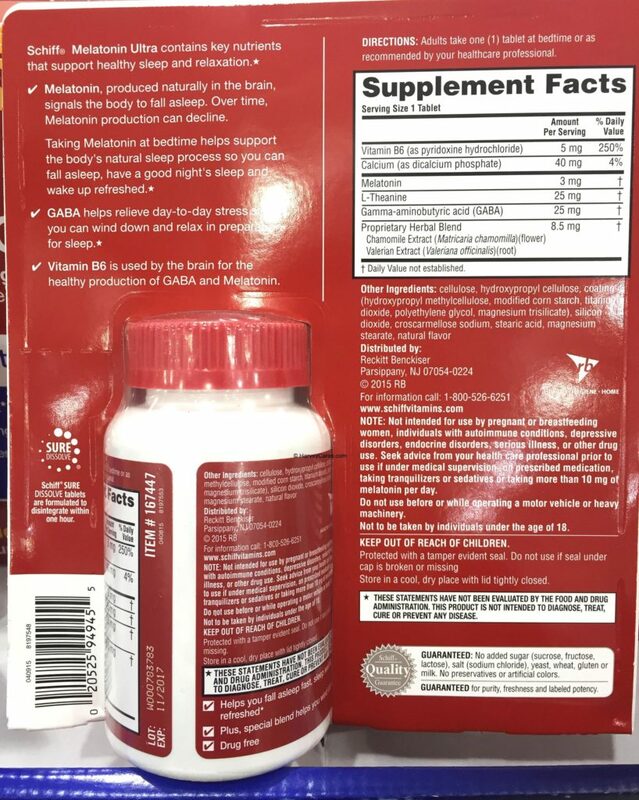 Another ingredient in this Melatonin dietary supplement is GABA. The full name is Gamma-aminobutyric acid. GABA helps you relieve daily stress. It can help you wind down and relax so that you can sleep better. Stress is oftentimes a main factor in prevent good sleep. Schiff Melatonin tablets can help mitigate some of those factors. 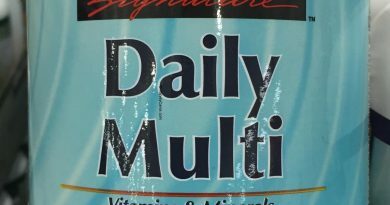 Vitamin B6 is one of the other main ingredients in this dietary supplement. Your body and brain uses Vitamin B6 to produce GABA and Melatonin naturally. Looking to Purchase Schiff Ultra Melatonin Tablets? Shopping for the Best Melatonin Supplements? The Schiff Ultra Melatonin Tablets is wonderful. Back to the good stuff! Take a look at the detailed product review of Schiff Ultra Melatonin Tablets below. Item name: Schiff Ultra Melatonin Tablets. Theanine, GABA, and herbal blend. 3 mg of Melatonin per tablet. Sleep well and wake up refreshed. Ingredients: Vitamin B6. Calcium. Melatonin. L-Theanine. Gamma-aminobutyric acid (GABA). Proprietary herbal blend (Chamomile extract. Valerian extract). Other ingredients include: Cellulose. Hydroxpropyl cellulose. Coating (hydroxypropyl methycellulose. Modified corn starch. Titanium dioxide. Polyethylene glycol. Magnesium trisilicate). Silicon dioxide. Croscarmellose sodium. Stearic acid. Magnesium stearate. Natural flavor. These Melatonin tablets contain no preservatives. There are no artificial colors. Schiff Melatonin tablets are also wheat and yeast free. This melatonin tablet also contain no added sugar and no added salt. It is milk free for those who are lactose intolerant. Schiff Melatonin tablets are also gluten free. Most importantly, this dietary supplement is drug free. What does this all mean? For me, I am comfortable taking this product to support good sleep and relaxation. Without worrying about long term health affects. Whenever I take this product, I also don’t worry about being addicted to it. Or being reliant on it. Since this is a drug free product, I believe there would be less risk for dependence. The Schiff Ultra Melatonin Tablets serving size is 1 tablet (1 pill). 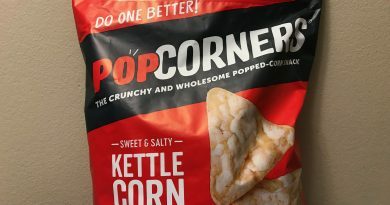 There are about 365 servings per container. 0 calories per serving. 0 calories from fat per serving. Take one tablet at bedtime. Or follow the directions of your physician. Use this Melatonin product responsibly. Do not use before or while driving. Or before or while operating heavy machinery. This Melatonin dietary supplement is not intended for individuals under the age of 18. Or those suffering from conditions including depression. Melatonin is naturally produced in the brain. It is a chemical that signals the body to fall asleep. As you age, your Melatonin production can decline. Melatonin levels can also be impacted by a variety of other reasons, including mood, stress, diet, and other factors. Taking Melatonin before you sleep can help support your natural sleep process. The Melatonin supplement can help you fall asleep, sleep well, and wake up recharged. GABA is Gamma-aminobutyric acid. GABA can help relieve daily stress. It can help you wind down and relax so that you can sleep better. Stress is oftentimes a main factor in prevent good sleep. Schiff Melatonin tablets can help mitigate some of those factors. Stress can be subconscious. It impacts many aspects of our health. Sleep is the biggest of them all. This is due to how important sleep is to our overall physical and mental health. Vitamin B6 is one of the ingredients in this dietary supplement. Your body and brain uses Vitamin B6 to produce GABA and Melatonin naturally. I have seen this product on discount occasionally. 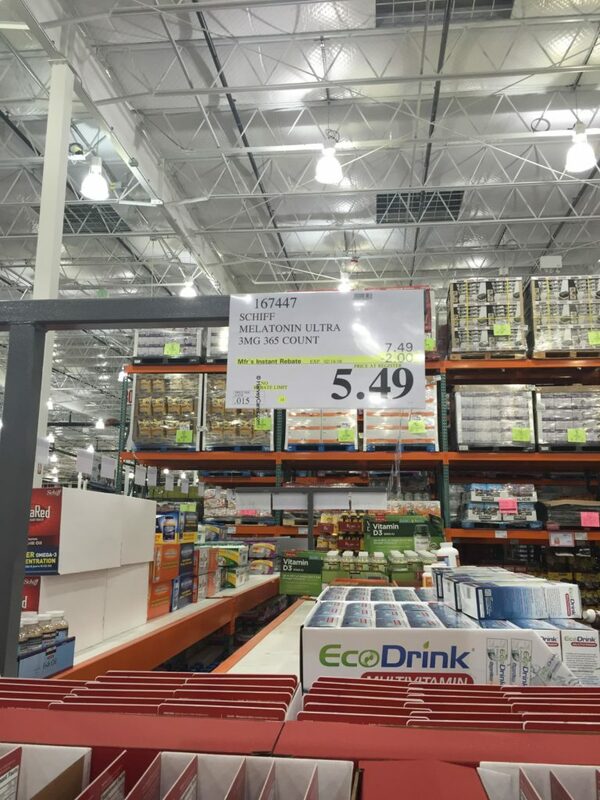 The item is available on Costco.com. However, it is selling at $9.49 with shipping and handling included. 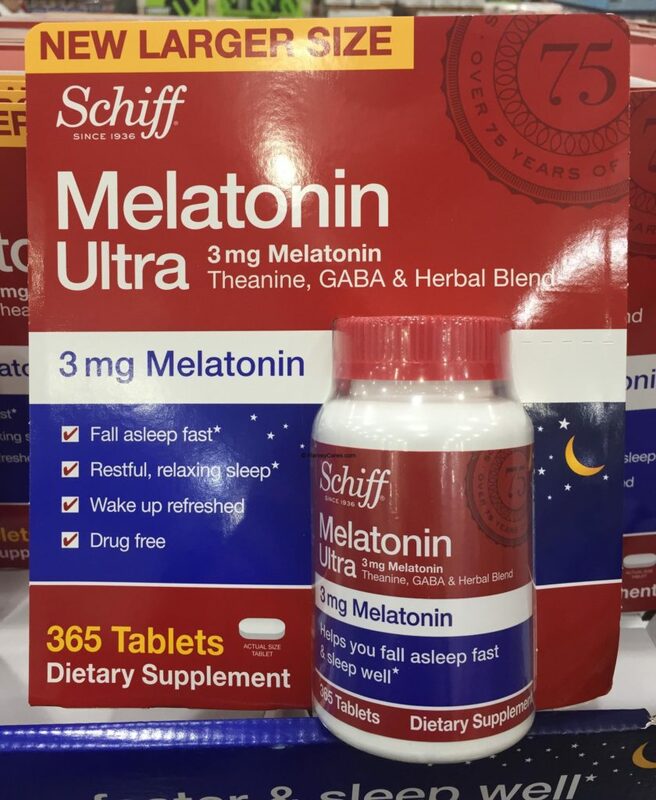 Have you bought the Schiff Ultra Melatonin Tablets before?